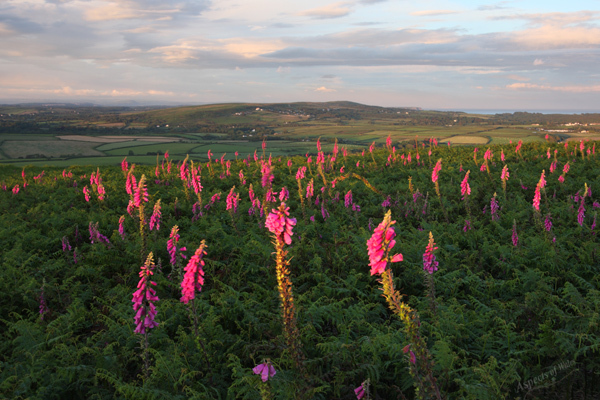 This photo was taken in the evening on 7th July 2012, looking east across Gower towards Cefn Bryn from Hardings Down, near Llangennith (NGR: SS4349990804). Hardings Down is notable for its three Iron Age hillforts, the remains of which, namely the perimeter banks and ditches, are clearly visible from the road entering Llangennith and from aerial photographs. Canon EOS 40D, Canon EF-S 10-22mm lens at 22mm, Manfrotto tripod. Exposure F11 at 1/15, 1.8 and 1/4 secs manually combined. Original image in Raw format.